Complete Marine Logistics from Bow to Stern. TransMarine, a service of TransGroup Global Logistics, is the ideal extension to your maritime shipping channels. Whether moving time sensitive equipment such as refrigeration units, a CP prop for your Z-Drive, or galley appliances. 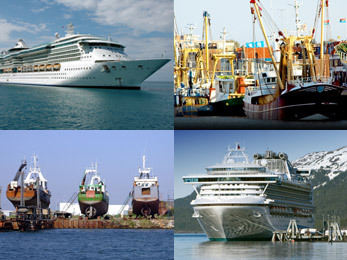 TransMarine is your logical choice for any and all maritime shipping needs. We understand that any delay while in port can cost you money which can damage your bottom line; that is why our logistics professionals are here to serve you 24 hours a day, 7 days a week. Our staff goes above and beyond just shipping - we coordinate with your suppliers and vendors to ensure timely pickup and product availability. In addition, our IT systems give you the visibility you need to coordinate important mechanic deadlines, sailing schedules, and crew-ups, via our inbound control management. Port Engineers and Accountants alike will enjoy our consolidated PO Management system for a seamless flow of information. Whether a stranded Fishing Vessel or Tug and Barge that is waiting for a much needed part before sailing, TransMarine has it covered - seamlessly and efficiently. Between the remote regions of the Aleutian Islands, Bristol Bay or the Kenai Peninsula, to suppliers in Seattle or construction in New Orleans and ship yards in Massachusetts, TransMarine is your complete marine transportation logistics provider.